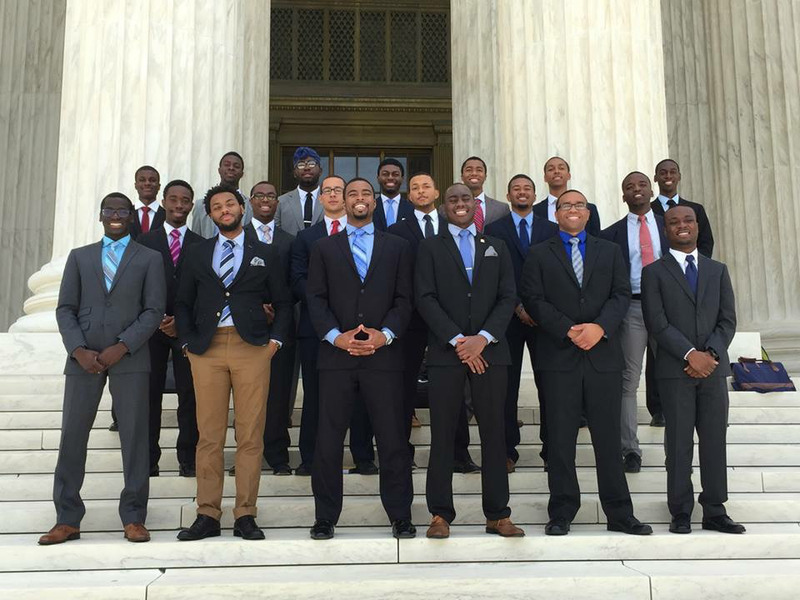 Justin Lang, a psychology and sociology double major graduating in May 2017, is beginning his commitment to learning, leadership and brotherhood through the Institute for Responsible Citizenship in Washington D.C, an organization for some of the nation’s top African American male college students. Out of the hundreds of applicants, Lang was selected as one of 23 scholars from all over the country, representing Ivy League, liberal arts and Historically Black Colleges and Universities. The program lasts for eight weeks, beginning in June and ending in July, and is a two-summer commitment. During the first summer, students take a class on constitutional and economic history through The Institute of World Politics, work full-time at an internship in their field of interest, meet with prominent public and private sector leaders and build brotherhood within their cohort. Professional development, character development, mentorship and graduate school preparation are priorities for the second summer, while also working a full-time internship. This summer, Lang is a policy research intern at the Children’s Defense Fund (CDF), a non-profit child advocacy organization. Lang said the position has given him broad exposure to the public policy process, with the opportunity to work on each of CDF’s policy areas including early childhood development, gun violence prevention, child poverty, juvenile justice and education. Along with writing fact sheets and reports, Lang has also attended House briefings and coalition meetings, watched appropriations markup meetings, and was present outside the Supreme Court when the King v. Burwell decision was announced. The institute prides itself on its commitment to prepare “extraordinary men to do extraordinary things.” Lang said that the program has empowered him to be an even better leader as he steps into his new role as the president of Belmont’s Black Student Association. “I have experienced growth as a man and have had the opportunity to gain ideas from the talented student-leaders in my program. I have also received graduate school and career advice that will help me move forward as I grapple with my interests and passions. The program has encouraged me to continue making the most of my opportunities and has reinforced my desire to use my abilities to serve,” he said. When asked about the program, Lang said it has been nothing short of an incredible learning experience. Lang has had the opportunity to meet General Colin Powell and Justice Clarence Thomas, and will meet Representative John Lewis next week. The group also took a trip to the home of the late Dr. Robert Russa Moton where behind-the-scenes work of the Civil Rights movement was done. “This was perhaps my favorite trip, as it was a quiet place where we were able to reflect on the legacy left behind by those before us, and how we can carry on that legacy. I am beyond grateful for each of these humbling experiences,” he said. After graduation, Lang hopes to pursue a PhD specializing in the sociology of education and eventually work in education policy and reform. Lang said that working at CDF and living in Washington, D.C. has exposed him to the application of research skills and social sciences outside of academia, as well as created many opportunities for exploring future graduate school and work paths.